Mr Griffin said his arrest was "politically motivated"
The leader of the British National Party has been released on police bail after being arrested following the screening of a BBC documentary. 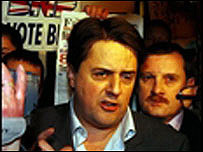 A party spokesman said that Nick Griffin, 45, had been held on Tuesday morning on suspicion of incitement to commit racial hatred. Mr Griffin said he believed his arrest was "politically motivated". Three men have been charged with racially aggravated harassment as part of the police inquiry into the BNP. The party's founding chairman, John Tyndall, was also arrested on Sunday. The police investigations started after the BBC's July screening of the Secret Agent documentary featuring covertly-filmed footage of BNP activists. Mr Griffin was the 12th man to be arrested following the documentary. He was held at his family home in Wales before being taken to Halifax police station for questioning. On his release Mr Griffin claimed the party was being "demonised" by the Government which he said saw the BNP as a threat. He said: "The police have nothing to do with this. The CPS, David Blunkett, John Prescott, Tony Blair are having a go at a dangerous political rival." Mr Griffin added: "The idea is I'm going to be back here in March and bailed until then. At that point (it) is coming up to a general election. "It's to demonise us in our electoral chances. After that the CPS know the charges against me won't stick. They're going to be dropped quietly after the election." A statement from West Yorkshire Police said enquiries into the activities of BNP members were ongoing. Six men from West Yorkshire and another man from Leicester have been arrested and freed on bail. Two men, both from Keighley, were arrested in September on suspicion of conspiracy to commit criminal damage. A 24-year-old man from Leicester was detained on Monday on suspicion of incitement to commit racial hatred. West Yorkshire Police said the three men charged, from Bradford, were due to appear at Leeds Magistrates' Court on Thursday.